After the releasing of Huawei E5786 – World’s first LTE cat.6 mobile hotspot, Huawei presented two new LTE Cat.6 mobile routers Huawei E5885 and E5787 last year for LTE advanced networks. Then here comes the question: why did Huawei present two new LTE Cat.6 mobile hotspots almost at the same time? 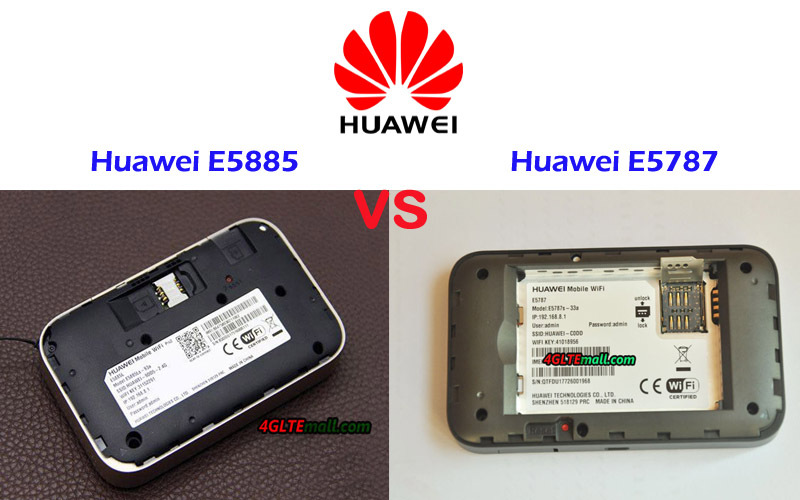 What’s the difference between Huawei E5787 and E5885? Which one is better to buy if a user wants to buy one from the Huawei 4G Wireless Routers? In this article, we will compare the difference between E5887 and E5885 and you may find the answer. Upgrading from Huawei E5786 hotspot 4G, Huawei E5787 MiFi is configured with a 2.4-inch touchscreen with two connectors for external antennas. So it’s also called Huawei Mobile WiFi Touch. The connector type is TS-9. The back cover of Huawei E5787 can be opened and the battery is removable for exchange. There is only a power button on the top edge side and on the opposite side, there is a USB 3.0 port. Unlike the Huawei E5787, the Huawei E5885 doesn’t have a touchscreen. There is only a small LCD screen to show the connection status. And there are also no connectors in Huawei E5885 for external antennas. The special feature of Huawei E5885 is that it has an Ethernet port for WAN & LAN connections. And USB input and output ports are available for power charging. With the interfaces, the WPS and power buttons are located. The back cover could be removed but the battery is built-in and non-removable. The features are very similar to its predecessor Huawei E5770 Mobile WiFi Pro. From the specs table above, we can see the Huawei E5885 and E5787 are both LTE Category 6 mobile WiFi hotspots which could achieve download speed up to 300mbps and upload speed to 50mbps. They both have same WLAN features. The Huawei E5787 could support maximum up to 10 users while Huawei E5885 could support up to 32 WiFi users. 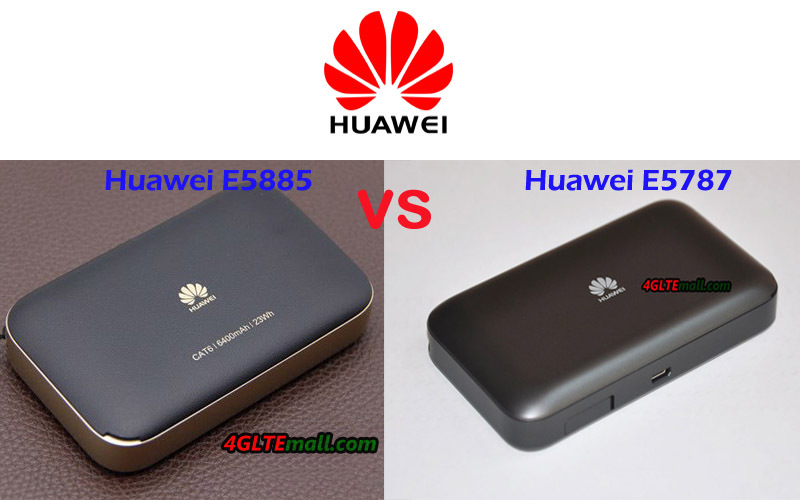 Except that the antenna connector difference, the Huawei E5885 has a large battery pack of 6400mAh while Huawei E5787 is configured with only 3000mAh battery. 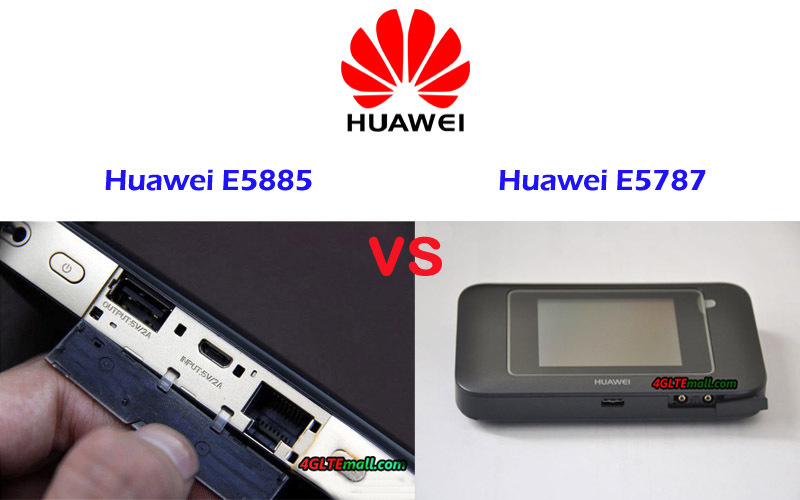 The large battery of Huawei E5885 could make it work like a mobile power bank to charge other electric devices such as Pads, tablets, smartphone etc…And Huawei E5885 allows quick connection to its WiFi via NFC. The pity is that Huawei E5885 doesn’t have the antenna connectors for LTE antenna. Here now Huawei E5787 WiFi router has two variant models while Huawei E5885 has only one variant model E5885Ls-93a. From the supported LTE frequency bands, we can’t tell which one is better. It depends on the potential users’ network providers’ networks. And Huawei E5885LS-93a seems to work with more network carriers worldwide. In our opinion, the Huawei E5885 seems to be more powerful and practical for users. What’s more, it has a better price than that of Huawei E5787. However, whether it suits you, you need to decide yourself.